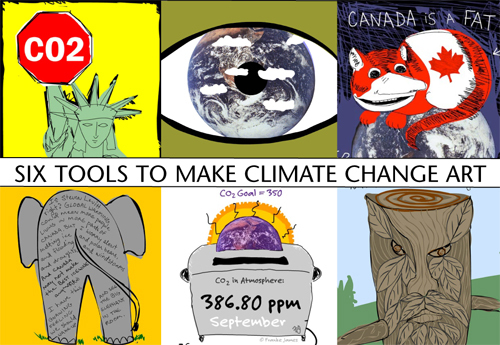 What Powerful Tool Can We Use to Fight Climate Change? “The battle is getting desperate, the odds long, so it’s time to pull out a big tool in the fight against global warming: ART.” Bill McKibben, 350.org. This week, 350.org, launched 350 eARTh, a planetary artshow, so mammoth it’s being photographed by space satellites. In more than a dozen places around the globe, artist’s drawings were brought to life by thousands of people, on snowfields, desert sands, city parks, or the waters of tropical lagoons. In New Delhi, India, 3,000 students and teachers used the metaphor of an elephant to ask world leaders to not ignore the “elephant in the room” — climate change. Let’s help World Leaders see the Big Picture. Art is a big tool in the fight against climate change. It is the heart of persuasion. It has been central to every modern social movement – because it infiltrates our beings, changes attitudes, and inspires action. When we FEEL it, we want to DO it. 350 eARTh is calling on people to use their most powerful skill—their creativity—to convey the urgency of climate change — and what the number 350 means for our planet. For 350 eARTh, our challenge is to paint pictures that will help world leaders “see” what 350 means. 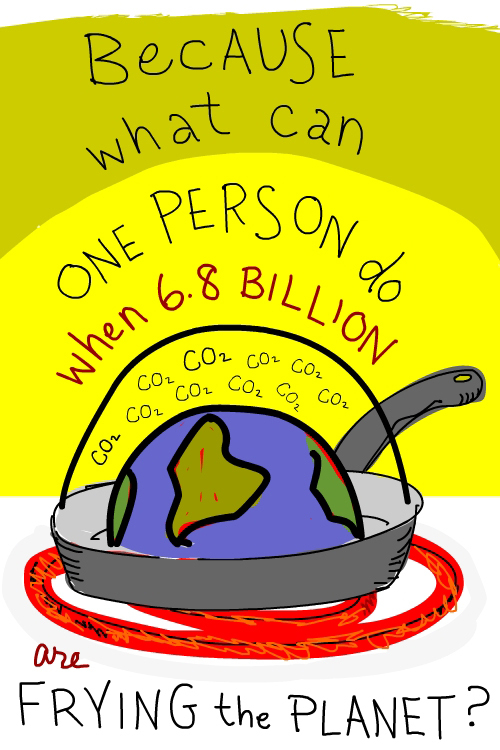 Can you draw a picture that will help the leaders see how you feel about climate change — and why getting back to the safe zone of 350ppm is critical to life on earth? The CO2 Toaster: showing rising CO2 in the atmosphere. CO2 in the atmosphere is now over 387ppm — and going up and up. Scientists tell us we need to get back down to the safe zone (350) or we’ll reach an irreversible tipping point. Usually scientists show rising CO2 in a graph. But for me, graphs are boring… a metaphor is a stickier way to remember the problem. The inspiration for this was a simple thought: We are toasting the planet. The animation above pulls the latest monthly NOAA data for atmospheric CO2 from the Mauna Loa Observatory in the United States. The widget can be added to any website to help people keep track of rising CO2. It was recently featured in a Science-Art exhibit. 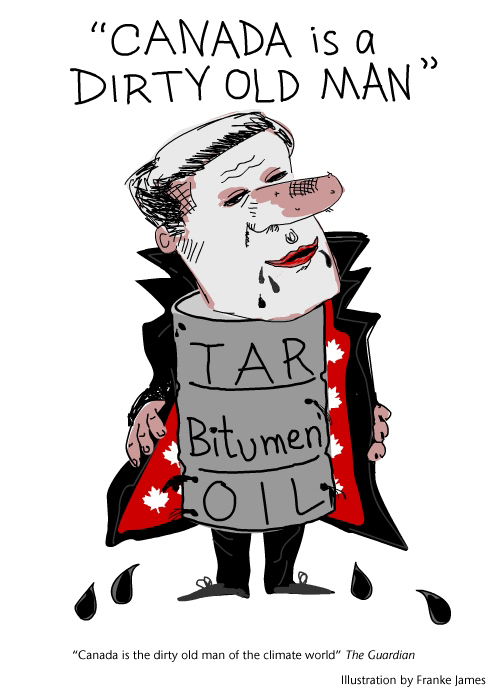 Is cuddly Canada the Dirty Old Man of the Climate World? Last December, the Guardian wrote this about Canada, “In stark contrast to its cuddly international image, Canada is the dirty old man of the climate world – missing its Kyoto emissions reduction target by a country mile (by 2007, it was 34% above its target) and showing no signs of reigning in its profligacy.” The Guardian’s colorful phrase inspired me to create the illustration above. Canada went on to snag the Colossal Fossil Award, for the third year in a row, as the most obstructive country impeding climate change policy. Unfortunately, my country, Canada has continued living up to its “dirty old man” reputation. In a surprise vote, the Canadian Senate has just defeated the Climate Change Accountability Act (Bill C-311). This is a major blow to democracy, as Bill C-311 had previously passed in the (elected) House of Commons, and the Senate is unelected (filled with people handpicked by the Prime Minister). Fat Cat Canada continues to defend its right to pollute our shared atmosphere. 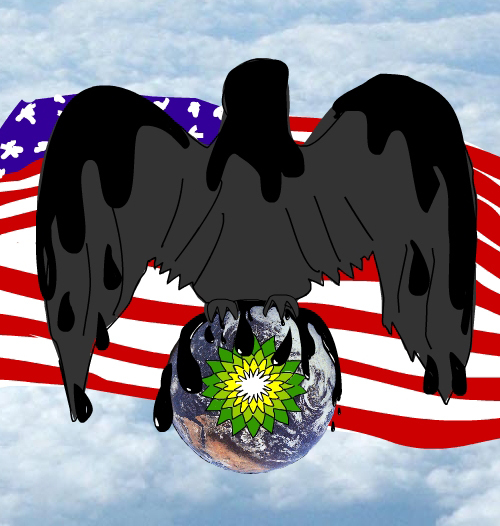 The illustration below is from Ending the Climate War, which talks about the BP oil disaster in the Gulf of Mexico, and the climate bill in Washington.